The height of women within the ages of 18 to 24 years old is normally distributed with a mean height of 60 in. and standard deviation of 2.5 in. The normal curve is plotted below. Looking at the x-axis of the normal curve, the points labeled A, B, C, D, E, and F are set at unit intervals of the standard deviation above and below the mean. This is just like how we labeled the normal curves in class. For example, points A and B are set at one standard deviation (which is 2.5) above and below the mean, i.e. at 57.5 and 62.5, respectively. 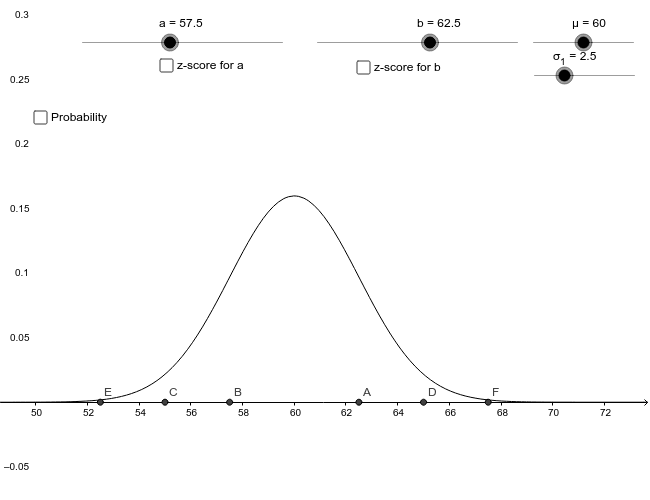 Likewise, points C and D are two standard deviations above and below the mean, i.e. at 55 and 65, and E and F are three standard deviations away at 52.5 and 67.5. We will use the sliding buttons (a) & (b) to try to answer some questions. 1). Click in the box labeled "Probability". There will be a shaded region under the curve between the number that the sliding buttons a and b are set at. What numbers are these set at? Using the methods from class, find what percent of the whole population of women's heights should be between these two numbers. Now, look at the number below the Probability box labeled "Prob". What is this number? Does is agree with the number you found (it will be in decimal form so you will have to convert it to a percent)? 2). You can change the where the shaded region under the curve is by changing the numbers a and b using the sliding buttons above the curve. Click on the button for a and slide it down to the number 56. Click on the button for b and slide it up to the number 64 (Note: you can also click on the buttons and use the arrow keys on the keyboard to move them). Using the number that is calculated at "Prob", what percent of the curve is shaded? 3). Now, move the button for a on the slider all the way to the left. Move the button for b on the slider to the number 62. What percent of the shaded region is less than 62? 4). Now move the button for b all the way to the right. What percent of the curve is shaded now? Leaving b where it is, move the button for a up to the number 54. What percent of the curve is shaded above 54? Hopefully you are getting the hang of the buttons. Let's see if you can do some of these on your own. Use the sliding buttons for a and b to answer the following questions. 5). What percent of the population of women's heights is less than 59 inches? 6). What percent of women's heights are above 62 inches? 7). If a woman is selected at random from the population, what is the probability that she will be less than 58 inches tall? What is the probability that she will be between 56 and 58 inches tall? 8). What height would a woman have to have to be in the: 12th percentile? 56th percentile? 9). What height would a woman have to have for there to only be 9% of all other women taller than her?